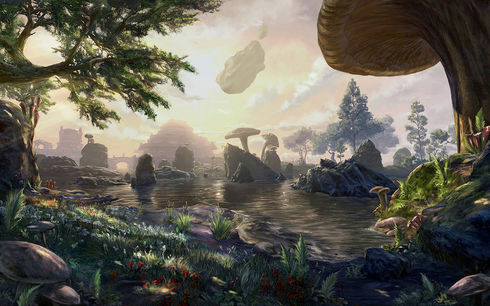 Surrounded by the Inner Sea, the sprawling volcanic island of Vvardenfell dominates northern Morrowind. The ominous, ever-smoldering peak of Red Mountain looms over this strange land. At a small shrine where the road forks. Mount Assarnibibi (North of Molag Mar) (map) Follow the main road north of Molag Mar. Skyshard is at a Y-shaped fork. In ES III Morrowind, this shrine is where you are sent to obtain the Ebony Mail. On an isle facing the Sea of Ghosts. E of Hanud Tower, SE of Vos (map) Look for the large C-shaped island. The Skyshard is on the smaller island to the east. On a Dwemer overhang, above a river of lava. Mzanchend (map) In ES III Morrowind, Mzanchend is the Dwemer fortress where you obtain Dwemer Schematics for the Telvanni Stronghold. On an outcropping overlooking a grisly scene. Below Esutanamus (map) Jump down from above. Alternatively, look for a fire with a dismembered corpse, then climb up the rocks. In ES III Morrowind, Esutanamus is a shrine to Molag Bal. In a hollow stump on the wetlands. Mawia (North of Tel Branora) (map) On a little island at the base of a large tower, directly south of Molag Mar wayshrine. In ES III Morrowind, Mawia is a Velothi tower containing a necromancer. Withheld at customs and stored in the yard. Seyda Neen Governor's Office courtyard (map) Next to the Governor's Office. In a stump on the northern shore of Lake Amaya. Just west of Suran. In a stump. On the northern shore of Lake Amaya. (map) In an area with Netch Gouger goblin enemies. In the heart of crumbling Daedric ruins. Ashalmimilkala (map) On a platform in front of a blocked door. In ES III Morrowind, Ashalmimilkala is a shrine to Mehrunes Dagon. Beneath the Dwarven bridge. NW of Gnisis, under bridge leading to Arkngthunch-Sturdumz (map) At the lowest level of Gnisis. Look out for cliff striders. On a treacherous path overlooking a sea of fire. SW corner of Nchuleftingth Lavaworks, overlooking one of the last parts of the dungeon (map) Just before you talk to Neramo in The Heart's Desire. Heaped onto a cart of stone left on a precarious perch. Forgotten Wastes, center of Caverns of Kogoruhn part (map) Go through Drinith Ancestral Tomb to reach the Caverns of Kogoruhn. Nestled with glittering treasures where the red crystals glow. Khartag Point (map) Down a very narrow side passage on the eastern side of the delve. Hidden deep within a shrine to the Prince of Corruption. Ashalmawia (map) Lowest level, before the natural cave part. A summoning circle that spawns waves of enemies is right in front of it. Where cliff-striders bask under golden rays in their den. Zainsipilu, NE (map) On the lowest level of the cave. Enter the cavern through a hidden entrance behind a waterfall. On an islet in the subterranean lake. Matus-Akin Egg Mine (map) Easy to find since there is only one watery area in the delve. In a cozy bandit's den. Pulk (map) On the lower level of the delve, inside a box in a furnished alcove. In the deepest depths of a subterranean Dwemer ruin. Nchuleft Depths (map) On the very lowest level near the boss, Nchuthand Far-Hurler. This page was last modified on 3 February 2019, at 17:42.